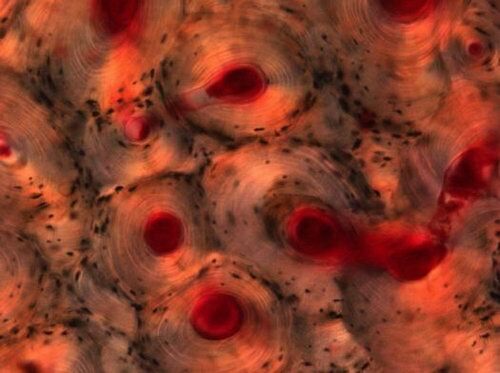 Here are some of the winners’ image of medical images of 2009 from wellcome image award. Before I read the content… I saw those are some kind of impression paintings…lol. 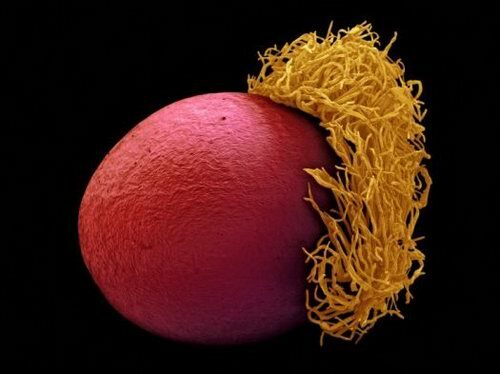 Anyway, those electron microscope images looks really impressive….Now, welcome to the microscope world…. This watercolor-like image shows a part of the human thigh bone. Specifically, it shows the compact bone, which provides strength and rigidity and is solid in appearance. Shown in red are Haversian canals, part of the compact bone’s intricate circulatory network. The tiny black spaces shown in this image are due to the loss of living bone cells during processing, leaving holes within the bone. 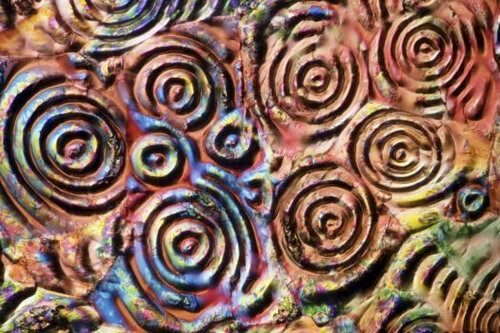 In this image, crystals of aspirin, that common drug used to relieve minor aches and pains, look more like psychedelic visuals caused by a totally different kind of drug. This strange object is actually a seed from a bird of paradise plant (Strelitzia reginae). This plant is native to South Africa and has a distinctive orange and blue flower, which resembles an exotic bird. The image was taken using an electron microscope. 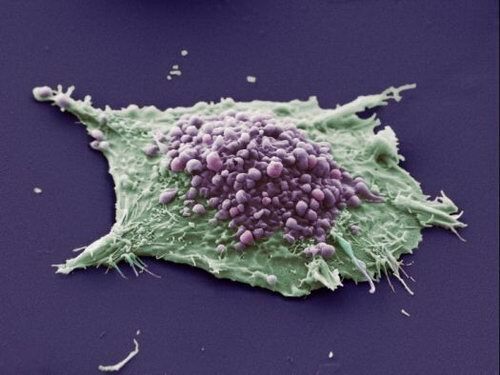 This image shows a single cell grown from a culture of lung epithelial carcinoma (cancer) cells. The purple area shows the formation of irregular bulges in the cell membrane, in a process called blebbing. Blebbing is important in a variety of cellular processes. The green area shows an area of the cell where the blebbing is not occurring or is not visible. 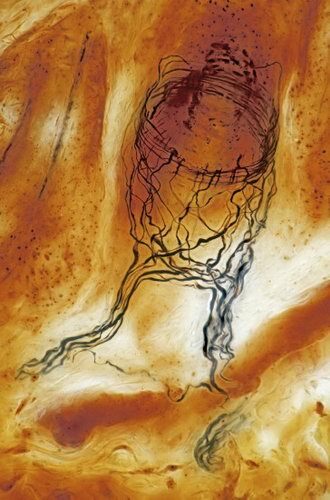 Rather than a ghostly jellyfish, this image highlights the sensory nerve endings at the end of a hair follicle. Sensory nerves are nerves that sense movement, pressure and pain. 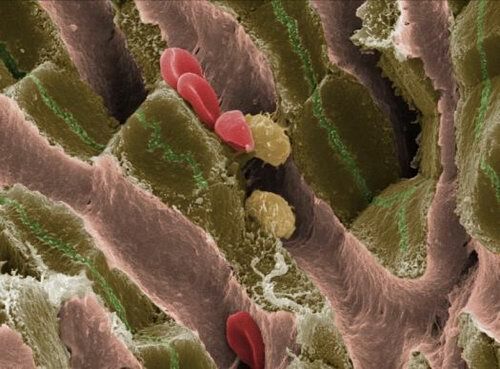 Stained in black are the fiber-like extensions of the nerve cells, called axons. 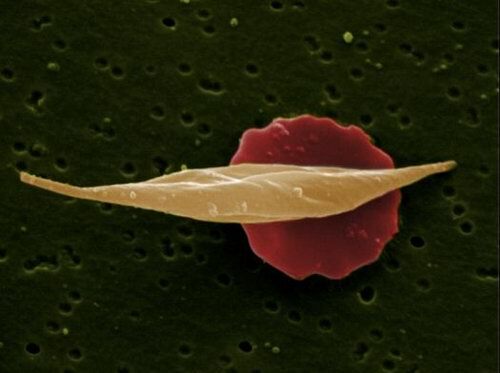 This image shows two red blood cells: a normal red blood cell (colored red in the background) and a red blood cell affected by sickle-cell anemia (in the foreground). Sickle-cell anemia is a blood disease that causes the cell to form a characteristic sickle-shape. This change in shape affects the cell’s ability to transport oxygen. This electron microscope image shows the internal structure and specialist regions of liver tissue from an adult mouse. Red blood cells and specialist immune cells are seen in the sinusoids, pink structures running through the tissue for circulation. Liver cells, shown in brown, are arranged in plates surrounding the sinusoids. Bile is secreted into the green channels between adjacent hepatocytes on its way to the small intestine. Next story Delicious Autumn! Colorful Autumn! I don’t own the copy right of those photos, you can try to contact the site.